More than 1000 people walked from Museum Africa to Hamidia Mosque in commemoration of Gandhi's 1908 Passive Resistance campaign. Prominent walkers included Minister Pallo Jordan, Minister Kgalema Motlanthe and Minister Ambika Soni (India). In August 1908, Mahatma Gandhi organised a Passive Resistance Campaign to get South Africans of Indian origin to resist the law that required all Indians to carry registration certificates. The culmination of the protest was the bonfire of 1908 where 2,000 protestors placed their certificates in a large iron pot and they were set alight. This bonfire of 1908 was an important event in the passive resistance or Satyagraha campaign of Gandhi and as such is part of our South African legacy. In commemoration of this event, the Gandhi Centenary Committee, the Indian Consulate in Johannesburg, the University of the Witwatersrand and the Centre for Indian Studies in Africa are hosting a series of events. 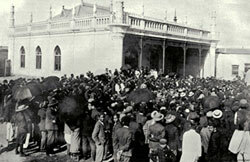 Most South Africans have a minimal knowledge of the role that Gandhi played in the struggle and the kinds of activities that he engaged in during his period. 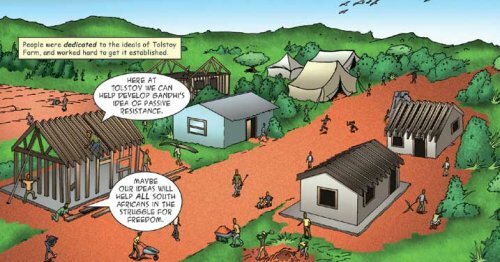 The Gandhi Committee, Johannesburg opted to develop a comic that depicts Gandhi’s South African period and introduces the readers to the tradition of resistance evident in our own struggle against apartheid in this country.